We Serve Coffee That Serves a Purpose, Here’s Why – Caffé Etc. At Caffé Etc., we only serve coffee that serves a purpose. This may sound crazy to you, but we’d like to see a better world where we assume peace is the only way to solve our problems, not war. That’s one of the many reasons why we carry Thanksgiving coffee. The family-owned company was created to link small coffee farms and cooperatives with consumers in California. The artisan coffee roaster finds the best coffee there is around the world and roasts it locally. Its goal is to promote sustainability while serving you one of the yummiest cup of coffees you will ever taste in your life. By now you may be asking yourself why we’re talking about Thanksgiving. Well, that’s easy: we really love them! But there’s one more reason for this blog post. We’d love to talk about two blends we have for sale at Caffé Etc. that you should take home right away. But there’s one more reason for this blog post. We’d love to talk about two blends we have for sale at Caffé Etc. that you should take home right away. The first blend we recommend is the “Delicious Peace,” or “Mirembe Kawomera” light roast. “In 2003, JJ Keki, a Ugandan farmer, walked door-to-door asking his Muslim, Christian, and Jewish neighbors to put aside old differences, confront their challenges together, and find a better price for their coffee. His neighbors agreed, and together, they formed the Peace Kawomera Cooperative. Theirs is the story of a community who risked everything—their farms and their livelihoods—to build a more prosperous future, and peace. The 1,032 farmers of the Peace Kawomera Cooperative produce beautiful Arabica coffee on the slopes of Mt. Elgon, in Eastern Uganda. Rich volcanic soils, antique varietals, and the farmer’s craft combine to produce a coffee that is rich and full-bodied, with distinctive hints of vanilla and nutmeg, and a nutty sweetness. This single origin coffee has a sweet body and a subtle perfume of fresh vanilla bean that hide a whole lot of power. Its full-body taste is complemented by hints of nutmeg and pecan. How can you not love it? 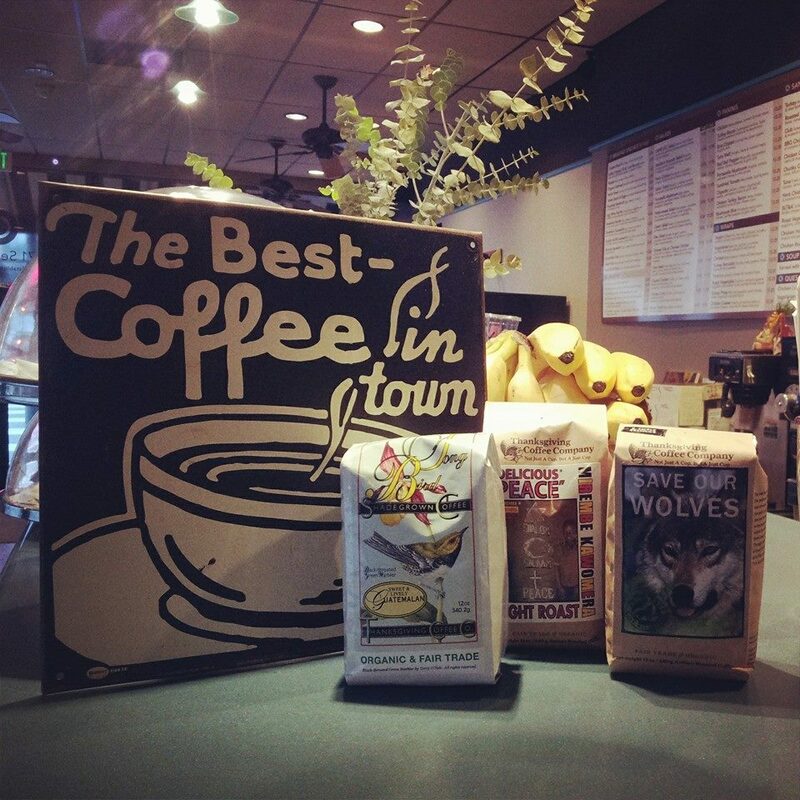 The Save Our Wolves dark roast is more than just a bag of coffee. It supports the work that Defenders of Wildlife does to ensure wild wolves and the habitat where they thrive are protected. “Rich, chocolaty, and intense Save Our Wolves Dark Roast is perfect for lovers of strong coffee and the work that Defenders does every day to protect wildlife habitat and endangered species. So what are you waiting for? Stop by for a visit to learn more about our coffees! What In The World Is A Macchiato?